Model IN-12608 is billed as an economical, automatic feeder, available with an automatic digital camera to accurately evaluate bird numbers. Designed to hold up to 120 lbs. 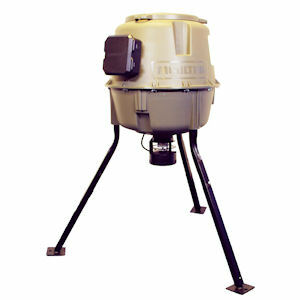 of OvoControl P “birth control” bait to reduce pigeon populations, the lightweight tripod feeder has a throw radius of up to 25 ft., to feed up to 150 birds. Featuring a programmable, digital timer and controller, the feeder operates on a 6-volt battery; an optional solar charger and rechargeable battery are available.